In our community of faith, we rejoice in our Lord’s resurrection. We have journeyed through the penitent season of Lent, walked with Christ through the sacredness of Holy Week, and we are now joyously singing the Alleluias of Easter. 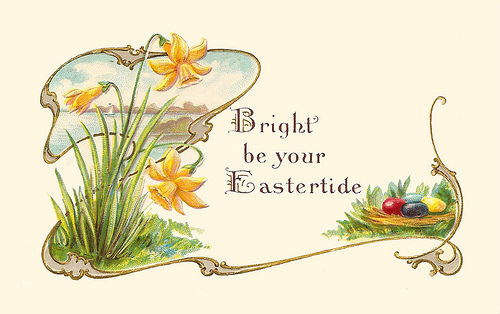 Eastertide – a season of new beginnings and a time in which we, through our journey, are renewed. After Christ’s resurrection, He was touching, transforming, envisioning, and breaking open new possibilities. It is now our chance to reveal the face and love of Good through Christ to those who are seeking a relationship with God. Or to those whe need to be reminded of the joy and wholeness that comes from being a part of God’s family. Being renewed, let us make Christ visible through our lives. Christ invites all his followers to bring the message of resurrection into the world. We can do this through prayer, through worship, through charity, and by inviting people to church and our community ministry dinner. We can do this through kindness, forgiveness, love and by sharing a persistent and genuine smile for those we meet or pass by. Why would we not be smiling? There is no message more joyful than the Easter message, no better news than the Good News Christ brought to the world. Let us all embrace and share the same hope as the early Christians. During this Eastertide, let us each day make Christ visible to our world. Jesus lives, moves and breathes. He changes lives, and He transforms the world.